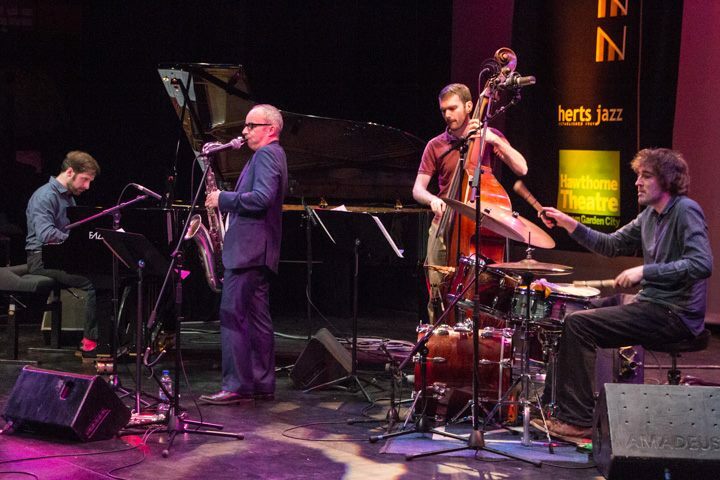 LondonJazz News: Your surname is unusual. Is it Spanish? Julian Argüelles: Catalonian, actually. My mother was from Catalan, although she considered herself Spanish. She wasn’t nationalistic in the way the people of Catalan often are. I grew up in Birmingham, although I’ve lived and played in Germany a lot. LJN: You’ve worked extensively with big bands throughout your career, more recently alternating with small combos. Julian Argüelles: The big bands are a way to express your writing chops — they’re a great palette to have. As a performer I like a small group sensibility and the fact that things can change quickly. In the slightly bigger small bands you have a greater range of colours — texturally there are more possibilities — but still have very much the small group mentality. I have a septet at the moment; septets or octets are great. But I started out in big bands. It’s a British tradition to play in youth jazz orchestras and at the age of 12 I was with NYJO. By 14 I was in the European Youth Jazz Orchestra. They were all quite influential on me, but it was the European one that was really a turning point. I was suddenly among other musicians who were less traditional, more avant-garde in their outlook. Also, these were people with a small group background. I’d listened to small group recordings of course — Parker and Coltrane — but I hadn’t played in small bands as these guys had. They had a different experience to mine. They weren’t necessarily such great readers, but they were great improvisers. My experience was formalised and controlled. These guys were freer. Regarding big bands, later when I moved to London I was lucky enough to be involved with some important ones. Not in any particular order, these were Loose Tubes, naturally, Chris McGregor’s Brotherhood of Breath, the Carla Bley Big Band and Kenny Wheeler’s band. LJN: Kenny Wheeler has recently passed away. Do you have any particular memories of playing with him? JA: Kenny was a Canadian but he was such an important figure in British jazz we embraced him as one of our own and thought of him as British. I remember the first few times I played with him was in small groups but one of the important events we shared together was playing on his 60th birthday tour with some really great musicians like Dave Holland, Evan Parker, John Abercrombie, John Taylor and Peter Erskine. It was beautiful. I was part of their two- or three-week tour. I was 23, very much the young person in that band. It was great for me to play with these musicians. We recorded this group for an album on ECM, Music for Large and Small Ensembles. LJN: That’s an album distinguished by particularly fine arrangements. Do you do much arranging yourself? JA: I’ve been doing a lot, for instance for these radio big bands in Germany — you can’t keep going over to work with them and just playing your own music! So I’ve recently arranged the music of Phronesis, a Scandinavian/British jazz trio, for the Frankfurt Radio Big Band. These German bands are well funded and can afford to pay for an arranger. Arrangers I most admire, again in no particular order, include Chris McGregor, Kenny Wheeler, Mike Gibbs and the guys from Loose Tubes, — Django Bates and Eddie Parker… Gil Evans I love. Duke Ellington, too, but Gil Evans resonates with me more — he’s more impressionistic. I like classical music, too. Composers like Vaughan Williams or Stravinsky. And Takemitsu, there’s a bit of a jazz sort of tinge to his stuff, quite impressionistic in a way. LJN: You’ve got a new quartet CD coming out that consists of all original compositions. Tell us a bit more about it. JA: It’s entitled Tetra and that’s the name of our group which features Kit Downes on piano, Sam Lasserson on bass and James Maddren on drums. These guys were relatively new to me — a different generation, in their 20s (I’m in my 40s). I came across them in the last four years. They’re all fantastic musicians and I love playing with them. As a composer I can write tricky stuff for them and they have no trouble playing it; I’ve been writing probably the most complicated small group music lately, quite densely written with odd metres and they’re not fazed by it. I’ve been playing with them for quite a few tours and we have a two-week tour coming up in Britain in October. We’ve previously done Canada and America and Portugal. It feels like a real band; it feels comfortable. LJN: Did you enjoy your recent appearances at Herts Jazz? JA: I was there on Friday with Loose Tubes, and also there with Tetra on Sunday. It’s great to see everybody in Loose Tubes and hear everyone playing so well. The band still sounds good. It was very much a band of the 1980s and we were all young men then so we were all curious to see how it would play out in the 21st Century, when we were that much older. But it’s still vibrant and it still works. LJN: You had a CD in 2010 called Ground Rush. People who’ve parachuted will recognise that as a sky diving term. Are you a sky diver? JA: I parachuted once when I was 18, for charity, and I suffered from a bit of ground rush. I hit the floor really badly and did my back in. I was very winded at the time and I got up and got myself together. A couple of years later my back started playing up, though I’m fine now. It was a lot of fun, actually. The term refers to when the parachute first opens, and you seem to be moving quite slowly so you’re caught unawares in the final moments when you approach the ground, and everything seems to accelerate. You can be unprepared and land not quite right. I had that title for many years and didn’t know what to do with it, but it kind of suited that band. LJN: We understand you’re about to start a new teaching job in Graz . JA:That’s right. I’m off there next week. It’s very exciting. I’m in the middle of chaos, getting stuff together before I go. I’m really looking forward to that — it will be an exciting life change.